Yet another post! Despite an implied battening-down-of-hatches in 2015. I’m sorry. I still lived stateside in 2015. My perspective has changed. My ’14/’15 tourist treks showed me the chasm between transit West Coast and transit West Europe. Two years of Spain residency have clubbed me over the head with it. I realize now that I never saw the mobility big picture while living stateside. If you care, think, talk, write or vote on or about transit-related issues in California, you ought to know how horribly the state transit grid sizes up next to what I ride daily in Spain. That does not mean I think that envy-struck Golden Staters should wave hasty wands over every big buck transit pitch on the ballot, particularly if said pitch promises to siphon funds from now-essential California bus service. It means only that the comparison matters. Transit works here as it never worked in L.A. or S.F. On to specific, occasionally repetitive examples, all easily corroborated with online maps and service schedules. Regular readers have watched my eyes open in related posts past. 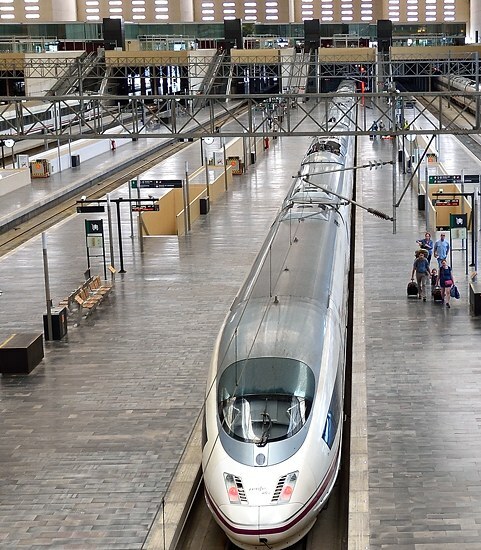 Inter-city rail: I could get up from the keyboard now, ride the metro to Madrid-Atocha or Madrid-Chamberi, and soon board a high speed train for Barcelona, Sevilla, Salamanca, Malaga, Valencia, and other cities across Spain. (Although not to some points north and west.) Barcelona is about as far from Madrid as San Francisco is from Los Angeles. Barcelona-Madrid service frequency aboard 150+ mph high speed AVE: hourly. Travel time: 2.5 to 3.1 hours. California may have operational high speed rail late in the next decade. What it has today is the Coast Starlight. San Francisco – Los Angeles service frequency: one train a day! Travel time: 11 hours. Urban rail: I live less than a block from a Madrid subway entrance, feel mildly scandalized if I have to wait more than five minutes for a train, weekdays and weekends. The metro grid blankets the central city, usually requires me to walk only a few blocks to my destination. If I yen to roam farther afield, I turn to the fast, brawny Cercanías commuter rail system, which links to the metro at more than two dozen stations and offers ten to twenty minute headways on most of the grid. The Los Angeles and San Francisco Bay Area metro grids, in contrast, are like skinny lines stenciled on the sprawling flank of an auto-dependent whale. (The BART map compensates with a Japanese Shunga-like exaggeration of the grid’s relationship to underlying terrain.) One may commute by metro to city centers, yes, and to the relatively few acres proximate to subway stations. If you want to go elsewhere, you’ll transfer to something slower. Bus: When I recall my California straphanging days, I most frequently picture myself in a bus: chugging through downtown L.A. on a 51/52 after a TransitPeople trip, steeling myself for a forty-five minute wagon ride on a jammed 29 or 43 in S.F. Here, I can offer no comparison. Two years in Spain haven’t yet motivated me to explore the city bus grid, although Madrileños describe it as excellent. I can go everywhere on the choo-choo. Image: I believe that San Franciscans are thought reasonable for living without personal cars, especially in the era of shared-ride-by-smartphone. In Los Angeles, I often felt stigmatized as a straphanger, TransitPeople and personal convictions notwithstanding. I couldn’t help noting the poverty of many fellow L.A. bus riders, the proportion of (much loathed) Transit TV ads dedicated to debt relief. In Madrid, in contrast, I know three car-free U.S. expat millionaires who rely on city transit services without hesitation. Everyone uses transit here: third generation gatos, tourists, communists toting fliers to Tirso de Molina, buttoned-down funcionarios, Franco-sentimentalizing conservatives. I sniff no trace of stigma. Personal cars in city limits are widely viewed as burdensome, albatrosses, unworthy consumers of time, effort, money. Not all comparisons favor Spain. 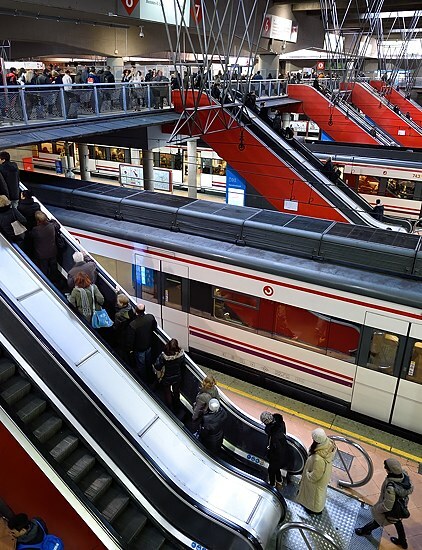 Expect serious crowding on some Madrid Metro lines at peak hours. BART offers more generous seats. Hollywood/Highland and other Los Angeles metro stations boast spectacular artwork. San Francisco hosts the touristy Cable Cars and Market Street Railway, and offers great Dolores Park views on the J line. I know of no Madrid equivalent to Los Angeles Rapid Buses. Further: some Madrileños — lifelong Spaniards, mind you, with a native’s perspective on how decisions get made — assure me that I can thank the country’s powerful construction lobby for the breadth of transit services. I don’t want to inadvertently suggest a wine-and-roses public sector on this side of the Atlantic. But, with those qualifications out of the way: if debating transit-vs-car issues in California, please pause to reflect on how abominably S.F. and L.A. transit compare to what I take for granted in Spain. Someone who says that “public transit can’t work” or that “no one uses public transit” either lies deliberately or hasn’t traveled, or both. I wouldn’t hold my breath waiting for similarly blunt comparisons from the mainstream American press. (Now ranked forty-fifth in the Reporters Without Borders World Press Freedom index, behind Burkina Faso and Romania.) I never worked as a staff reporter, don’t know how these things work, but a lifetime as a news consumer has taught me that the U.S. media is in no hurry to publicize the superiorities of life overseas. “Let’s encourage our coveted entrepreneurs and educated, law-abiding professionals to jump ship, so we’ll have more room for Newt, Rush, Diamond and Silk.” Apparently not. By American standards, Madrid is ancient. The ninth century Muslim Walls still stand near La Almudena Cathedral. Felipe II moved the capital here in 1561, more than a half-century before America’s Plymouth colony. Long-ago developed urban center = population masses dwelling in city acres that never anticipated the personal car. Mouse around in Google Maps, call up Street View in Madrid’s Latina, Chueca, Malasaña, Lavapies. Eager to berth a SUV on one of those skinny streets? Madrid needs a serious, grown-up, no BS transit grid, unless city leaders decide to evict millions, raze the capital, sell off most of the urban land area to the Irvine Company. Contrast ancient Madrid to greater Los Angeles. Founded by Andalucía native Felipe de Neve and a few dozen duped pobladores in 1781, sure, but the population didn’t boom until the twentieth century, and the boom accompanied — was joined at the hip to, shared vital organs with — the sale-to-the-masses of the affordable personal car, the gutting of the Pacific Electric grid notwithstanding. Cookie-cutter communities in the San Fernando Valley, Inland Empire, Orange County. Same deal in the Bay Area suburbs. Blocks and blocks, miles and miles of tract homes, each with driveway, lawn, back yard. Suburbia. The American dream. If I want to see a complete truth, I have to acknowledge how appealing this living-large-on-the-land lifestyle can look to some Europeans. You get your own yard, for gardening, pets, barbecue, for your kids to play in. Space between your house and the next house over, so you don’t have to listen to your neighbor’s thumping bass or woodworking tools. Access to big box shopping centers, with free parking for all, everything-under-the-sun U.S. of A. supermarkets. Never mind if auto-centric development can doom major urban centers to Houston-style homeliness. Never mind if environmentalists judge it as unsustainable, reckless, if it plunders the commons, steals from the unborn. Stare stonily past the iconic ‘space required to transport 60 people’ poster, that shows how rapaciously auto-dependent development devours resources. YOU get more. The Number One you look out for. You don’t make do in an eco-friendly cubby hole while Al Gore sprawls in a nine bath, sixty-five hundred square foot Montecito mansion. Reckless, short-sighted real estate development is more egalitarian, at least in this case, helps narrow the gap. He gets to live profligately. Free market capitalism lets you live profligately, too. A Cercanías sightseeing ride through Madrid’s afueras shows me kilometer after kilometer of high-rise residential development: some of it ritzy, some of it run-down, but much of it straight out of a Transit Oriented Development textbook. I haven’t knocked on doors to conduct surveys, but my decades of personal experience in transit-centric homes assure me that at least a few of those TOD dwellers are privately miserable, thanks to proximity-to-neighbors issues that wouldn’t plague them in sprawling ‘burbs. Should Tom Trekker journey by car, transit, bike or weary bunions to job, market, pharmacy, Flat Earth conference, Tinder assignation? I expect Tom to choose selfishly. How much does the train cost? How often does it run? Can he park? Is there a toll? How much is gas? Like that. A civic-minded Tom may opt for his transit pass in a toss-up choice between transit modes, but not if the choice would cost him a lot. Some committed environmentalists will sacrifice more, but I presume that they are rare, statistically insignificant. As travelers, we act collectively like acre-feet of water released on a slope. We go where the slope lets us go. Put Tom in Los Angeles. He lives in Culver City, just nabbed a swing shift gig at the Lakewood Marketplace, thirty miles southeast. The after-work drive might take a half-hour. Tom leans green, fires up Moovit to investigate transit alternatives. Moovit has ’em, all right: Tom may gird loins for a transit ride of TWO AND A HALF HOURS each way, with transfers and plenty of walking. Tom’s going to CarMax. Or he’ll Uber, or quit, or move. A crooked P.R. writer could paint his choice as a knock against public transit as a transit mode. It wouldn’t be. He would travel as poured on the slope, as city infrastructure encouraged him to travel. In the New York Times, I read of Koch Brothers efforts to kill U.S. public transit projects. In the Economist, I read of declining transit ridership, with a focus on U.S. cities. Forgive me for connecting dots, particularly if I reflect on last century’s Great Transportation Conspiracy. Age has taught me to pay more attention to such corollaries. Shaft, cheat and sabotage your adversary behind the scenes, bat innocent eyelashes while publicly pronouncing her proposal as unrealistic, misguided. “I hope they’re right,” thought I, as I read, and then edited myself: “In much of the U.S., something like that will have to be right.” What else are some growing, auto-dependent U.S. cities going to do? They didn’t expand around a brawny transit infrastructure, a la Stockholm or Copenhagen. They sprawled with the car, painted themselves into a corner. Shared-ride AVs or else. The world-class, powerhouse Madrid transit infrastructure coexists with endless clogged lanes of honking, smoking, particulate-spewing cars, cars, cars. Madrid makes room for them on traffic arteries, but not gracefully. Central Madrid wasn’t made for them. On some of those twisting, narrow central city streets, every car can feel like an intrusion. Conversation pauses as it approaches — noisily, on brick-paved streets — waits for it to pass, continues after it goes away. It’s easy to wave a toy wand from a little blog soapbox, decry problems uneasily fixed in the real world. I presume that Madrid provides a livelihood to merchants who would face bankruptcy without an auto trade, who know where political bodies are buried and how to push power levers, who may be happy to leave a pol alone if the pol leaves them alone. The real-world maneuvering must be plenty tough, but I feel confident in judging it as worthwhile. Nearly anything that these ill-suited-for-the-auto European cities can do to restrict traffic may be for the better, especially if said cities can attract tourists or hope reasonably for urban renewal. 7/26/2018: Two eenie-weenie style edits. This entry was posted in Expat, Transit, Travel and tagged Expat, Madrid, mass transit, public transit, public transportation, subways, travel. Bookmark the permalink. Post a comment or leave a trackback: Trackback URL.